Passing through the CIMA exams is tough. That's why you need to make sure you have something you are striving for. Of course becoming CIMA qualified is the first thing you will think about. But why do you want to become CIMA qualified? Where do you see yourself in five years? 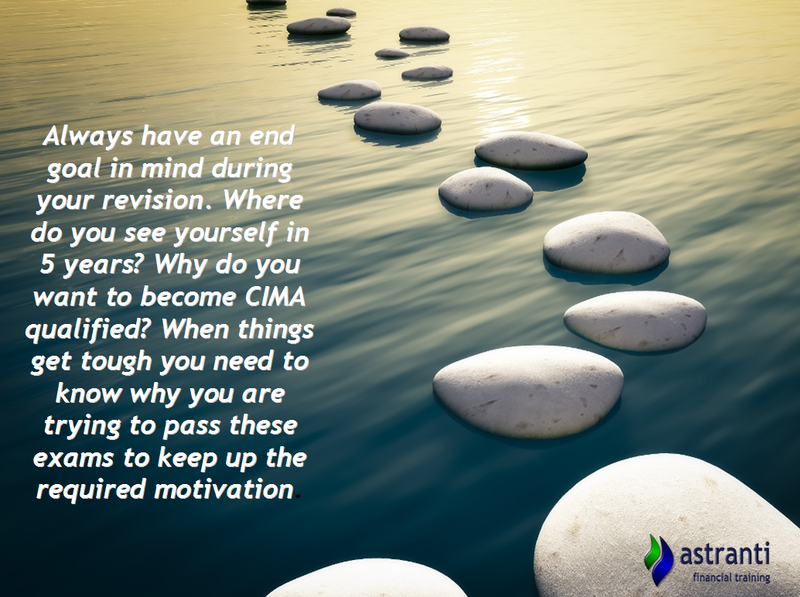 During the periods where revision is tough, or you are struggling to get through a particular exam, you'll need to have that vision to keep you going. Having an end goal is something which helps keep people motivated in a number of different settings. A jogger in the park often won't just be running around for no reason - they will be aiming to lose weight or train for a marathon for example. So why should passing through the CIMA qualification be any different? The CIMA process can seem like a long one and you often have to face passing an exam, and then moving straight on to another one. This could lead to you losing focus on the 'end game' and what it will mean to your life to become CIMA qualified. If you can have an idea of your future ambitions and goals it will help to keep you driven throughout your revision. In the meantime, we have a whole host of revision resources that can help you get through your revision and pass your exams!